The Sport GT S is the most exciting combination of luxury sedan and performance sports car that Maserati has ever produced. 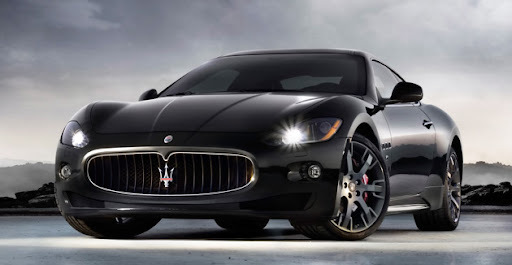 The Quattroporte Sport GT S is fitted with the most powerful engine in the Quattroporte range. Under the hood their is 4691 cc engine Capable of 440 HP at 7,000 rpm and a maximum torque of 490 Nm at 4,750 rpm, it raises the car’s performance to unprecedented levels.These figures have been achieved not only by modifying the engine’s electronic control parameters, but also through in-depth development of the racing exhaust system, a real jewel of engineering installed on this version. The Sport GT S engine touches the top speed is 285 Kmph. 0-100 km/h with in 5.1 sec. The system is controlled by air valves that open in SPORT mode to reduce back-pressure in the exhaust; this increases the maximum power available, and creates a throaty roar at low engine speeds and full symphonic sound of a genuine sports car at higher rpm. The new Quattroporte Sport GT S is equipped with the MC-Auto Shift software package for racing-style control of gear changes. In "MANUAL MODE" the driver controls gear shifts directly, and changes are permitted up to the redline on the rpm counter. For the most enjoyable, highest-performance driving experience, an electronic gear shift indicator in the middle of the dashboard tells the driver when it is the ideal timing of the gear change; this system, which enhances the pleasure and satisfaction of the driving experience when truly putting the car through its paces, is complemented by “Trofeo” style extra-long paddles behind the steering-wheel, ergonomically shaped for easier gear changes on the most demanding roads. MANUAL SPORT and AUTO SPORT modes both also provide electronic heel and toeing during down-shifts; this, combined with the Quattroporte Sport GT S’s other characteristics, make this saloon car capable of unprecedented sporty performance. The Quattroporte Sport GT S is fitted with the single-setting racing-style suspension system: developed to further enhance the car's handling, it makes its steering extremely sensitive and responsive. The additional stiffening of the suspension by 30% at the front and 10% at the rear, together with a reduction in ground clearance of 10 mm on the front and 25 mm on the rear axle respectively, provides a substantial reduction in load transfers and more effective traction control during direction changes. The electronic power steering is direct and precise at speed so the driver knows what the car is doing. At the same time, it is light and easy to use at lower speeds and when manoeuvring. The Maserati Quattroporte Sport GT S’s weight distribution is unique in its category with a slight bias towards the rear end (49% front and 51% rear). This split transforms the luxury saloon into a car where performance is favoured and that rewards the driver with its superb handling. This set up was achieved by shifting the engine behind the front axle to maximise traction and acceleration while also making the car stable and perfectly balanced. The new Maserati Quattroporte Sport GT S comes with a high performance braking system developed by Brembo. The 360 mm brake discs benefit from dual-cast technology: cast iron for the braking surface and an aluminium hub. This set up takes advantage of the consistent performance of cast iron at high temperatures and from the lightweight aluminium. LightsThe new Quattroporte Sport GT S uses front and rear lights that have been developed to offer only the best in each individual function. The use of LEDs makes a big impact on the car and is one of the elements that link this model to the Maserati GranTurismo. The most important lighting functions have been improved. The front xenon cluster now boasts the Adaptive Light Control system. This produces a brighter and clearer beam compared to conventional bulbs. The lights also automatically track the movements of the steering wheel so that the beam points to the inside of a curve (up to a maximum of 15º). For safety reasons, when the car is travelling above 120 km/h, the system returns to a traditional fixed position. The Daytime Running Light function is a useful addition and is made up of ten LEDs set along the bottom edge of the headlight. The indicators catch the eye and the front headlights are memorable for their side-marks that merge flawlessly with the outside edge of the car, with the wiper forming part of the cluster. The fog lights employ an altogether different set up and are located in the bumper to ensure a wider beam. This system is also used in the rear with 34 LEDs making up each light. This technology was employed because LEDs illuminate more quickly and produce a more intense beam than normal bulbs. They last longer, consume less energy and their performance does not dip over time. The design of the new Quattroporte Sport GT S has a sporty emphasis, yet does not compromise on the style and elegance that have always epitomised Maserati's flagship model. The designers at Pininfarina have succeeded in their aim of giving the car a sportier edge whilst preserving the integrity of the original design. The new grille is the most obvious exterior change. It is now wider and has vertical slats that echo the GranTurismo, whilst its black finish maintains the original styling cues. The deeper set grille is fitted to the front bumper, and is framed by the new fog lights and air intakes that have been enlarged to cope with the more powerful engine. The combination of the redesigned bumper and the new grille bestow the front end of the car with an immediate visual impact. Turning to the bodywork, the sweeping wing mirrors are more aerodynamic. The shape of the body below the doors lends the new model a more purposeful look. In profile, you can appreciate the car’s lowered stance: 10 mm at the front and 25 mm at the rear. These few millimetres make all the difference. The car appears poised as if on the starting blocks, ready for action with its racier set-up perfectly complementing the new 440 bhp power unit. The car exudes speed even when it is stationary. The Quattroporte Sport GT S comes with two new types of 20" wheel rim: Multi Trident rims in light aluminium alloy as an option and seven-spoke light alloy rims that have undergone the 'Dark Chrome' treatment. The most sporty model in the Quattroporte range also clearly proclaims its character through the style of its interior, using specific materials. 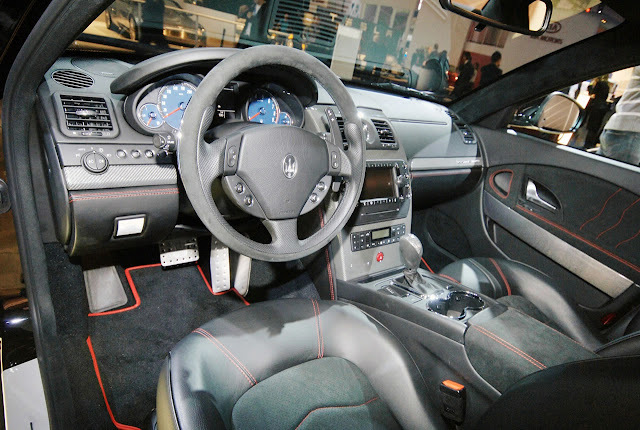 he seats, which are state of the art in terms of ergonomics and comfort, have a stylised M for Maserati on the backs. The central sections of the seats are upholstered in perforated Alcantara, for optimal breathability and a firm support during hard cornering; Alcantara is also used on the side panels, the front armrest, the steering-wheel and the gear lever knob. The interior finishes on this version are a celebration of technology and workmanship. The material used is the groundbreaking TitanTex, an ultra-lightweight aluminium-coated titanium fibre fabric, made even more special by a specific processing, which gives the interior a high-tech, high-performance look, as well as a shinier, more three-dimensional overall appearance. Aluminium pedals are available as an optional: specially designed for racing-style driving, they provide outstanding grip when the brake and accelerator are depressed and released in quick succession.